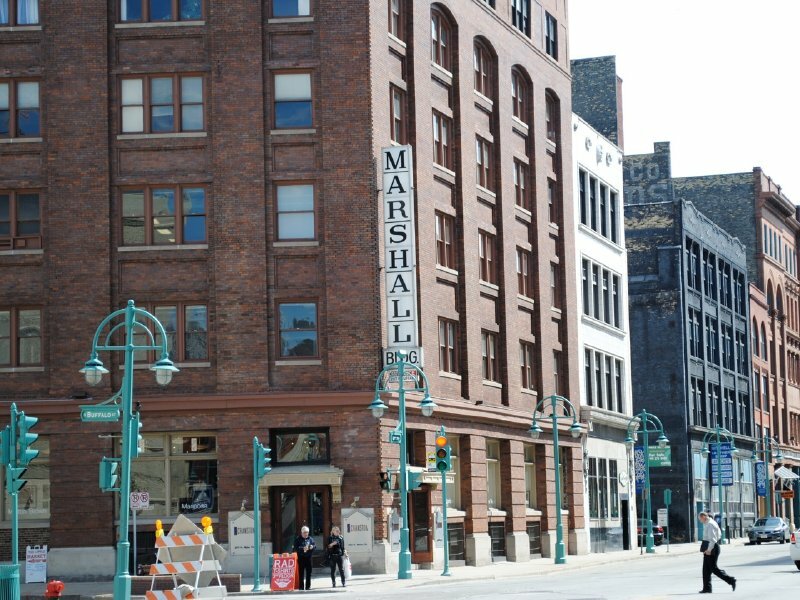 Since 1906, the Marshall Building has been a catalyst in transforming Milwaukee’s Historic Third Ward neighborhood. George Ferry and Alfred Clas were the masterminds behind the Marshall Building. The box-like shape and arched pavilions were common features of many warehouses at that time, yet the way it was constructed was groundbreaking. The pair also helped erect such esteemed structures as the Pabst Mansion, Cathedral of St. John the Evangelist tower, Cudahy Tower and Milwaukee Public Central Library. Built in 1906-07, the Marshall Building was a test project for Claude A.P. Turner’s pioneering construction method. Otherwise known as the Turner System or the Spiral Mushroom System, it used flat-slab concrete floors that were supported by mushroom-headed columns and reinforced with steel rebar. Today, the Marshall Building is the world’s oldest existing example of Claude A.P. Turner’s Mushroom System and is a National Historic Civil Engineering Landmark.  Located in the heart of Milwaukee’s vibrant Historic Third Ward, the Marshall Building is a century-old warehouse conversion boasting contemporary amenities and historic charm. Just steps from the Milwaukee Riverwalk, it is home to over 25 art galleries/studios, boutiques and offices. The Marshall building has become THE destination for the art scene in Milwaukee due to its talented & creative tenant roster. In the early years, its design by nationally renowned architects and pioneering construction had people buzzing. Decades later, George Bockl put the building on the map as an incubator for passionate, entrepreneurial types. Offering them an affordable place to launch their business, Bockl made a home for Milwaukee’s creative class. Now, over a century later, the Marshall Building continues to be an incubator for innovative ideas. This innovation continues as galleries throughout the Marshall building showcase exhibitions that have been organized specifically for the upcoming conference. Located with walking distance of the convention center you will not want to miss these great shows. Timothy Cobb Fine Arts Lobby, 414-255-8166. CIE The Corrosive Use of Money In Politics, Stephanie A. Rozene. By using symbolism and history Rozene raises the question of money’s corrosive use in politics and how it affects the American people through the use of pattern, gold luster and imagery. Hours During NCECA: Mon 10AM-6PM, Tues 10AM-6PM, Wed 10AM-6PM, Thur 10AM-8PM, Fri 10AM-6PM, Sat 10AM-6PM. Reception: Thur, Mar 20, 5-9:30PM. Mar 17-22. Gingrass Gallery, Suite 100, 414-289-0855. LG RIT School for American Crafts Ceramics Alumni Show. A juried exhibition of ceramic works from alumni. This show, broad in scope, highlights a variety of technique and aesthetic observation among these talented artists. Organized by Minkyu Lee. Hours During NCECA: Sun 11AM-4PM, Mon 10AM-6PM, Tue 10AM-6PM, Wed 10AM-6PM, Thur 10AM-9PM, Fri 10AM-6PM, Sat 10AM-6PM. Reception, Thur, Mar 20, 5-9PM. Mar 16-29. Lower Level, 414-289-0855. LG From Heaven to Earth, Bennett Bean, Melissa Greene, Jennifer McCurdy, Natalie Blake, Suzanne Crane, James Aarons, Curtis Benzle, Jef Raasch, Margaret Kenway Haydon, Michael Ware, Chuck Solberg. A curated group show of both established nationally renowned and emerging ceramic artists. This exhibition showcases the connection between the earth (clay) and the artist’s heavenly inspiration for its ultimate interpretation. Curated by David Schaefer. Hours During NCECA: Sun 11AM-4PM, Mon 10AM-6PM, Tue 10AM-6PM, Wed 10AM-6PM, Thur 10AM-9PM, Fri 10AM-6PM, Sat 10AM-6PM. Reception, Thur, Mar 20, 5-9PM. Mar 16-May 30. Timo Gallery, Suite 110, 414-223-3121. LG The Arizona Master: Michael Prepsky. Master ceramic works, both sculptural and functional, along with drawings, paintings and sketches, displayed in an exclusive retrospective of Michael Prepsky’s career. Curated by Timothy Meyerring (Timo). Hours During NCECA: Sun 9AM-5PM, Mon 9AM-5PM, Tues 9AM-5PM, Wed 9AM-5PM, Thur 9AM-9:30PM, Fri 9AM-9PM, Sat 9AM-7PM. Receptions: Thur, Mar 20, 5-9PM and Fri, Mar 21, 5-9 PM. Mar 16-22. Elaine Erickson Gallery, Suite 120, 414-221-0613. LG COAST TO COAST, Bruce Breckenridge, Gerard Ferrari, Gerrit Grimm, Rick Hirsch , Minkyu Lee, Beth Lo, Beverly Mayeri, Tom Meuninck, Ryan Myers, Richard Notkin, Richard Shaw, Christina West. Group exhibition featuring 11 artists from around the United States. Exhibited for this special event will be some of their finest ceramic pieces. Co-organized by Minkyu Lee and Elaine Erickson. Hours During NCECA: Sun Closed, Mon Closed, Tues 11AM-5PM, Wed 10AM-6PM, Thur 11AM-8PM, Fri 11AM-6M, Sat 11AM-4PM. Reception: Thur, Mar 20, 5-9:30PM. Mar 19-May 8. Frank Sadler Gallery, Suite 200, 414-278-1395. CIE Northernwood II – Wood-fired Work from Wisconsin, David Caradori, Tony Gebauer, Willem Gebben, Randy Johnston, Simon Levin, Jan McKeachie Johnston, Michael Schael, Reid Schoonover, Joe Singwald, Mark Skudlarek, David Smith, Mike Weber. Showing 12 of Wisconsin’s great wood-fire potters. Organized by Reid Schoonover. Hours During NCECA: Tues 10AM-6PM, Wed 10AM-6PM, Thur 10AM-6PM, Fri 10AM-6PM, Sat 10AM-4PM. Reception: Thur, Mar 20, 6-9PM. Mar 18-22. Greymatter Gallery, Suite 222, 414-687-2598. LG On Growth and Form, Shannon Sullivan. Sullivan’s sculptural objects, translucent floating wall panels and site-specific installations interpret and hybridize the patterns and prevailing ways of natural phenomena. Curated by Greymatter Gallery. Hours During NCECA: Wed 10AM-5PM, Thur 12PM-5PM, Fri 10AM-5PM, Sat 11AM-4PM. Reception: Thur, Mar 20, 5-9 PM. Mar 19-May 3. J Nikolai Art, Suite 302, 414-232-0090. CIE Generations of the Paoli Clay Family Show, Clayton Bailey, Randall Becker, Karl Borgeson, Bruce Breckenridge, Richard Burkett, Sandra Byers, Winthrop Byers, Jeff Campana, David Dahlquist, Chris Davis-Benavides, Lauren Faust, Jeannie French, Vern Funk, David Gamble, Tom Gilfillan, Gerit Grimm, Karen Gunderman, Geof Herman, Bruce Howdle, Don Hunt, Jared Janovec, Chuck Johnson, Mikel Kelley, Joanne Kirkland, Brian Kluge, Karen Koblitz, Richard Kuhnen, Phil Lyons, Lauren Mabry, Karen Massaro, Ryan Meyers, Miseal Naxi, Chris Noren, Jeff Noska, Noel, O’Connell, Charlie Olson, Barbara Reinhart, Don Reitz, Paula Rice, Cindy Ripley, Richard Shaw, Bob Shay, Mark Skudlarek, David Smith, Shannon Sullivan, Tanner Trowbridge, Andree Valley, Mike Weber, Kristen Williamson, Emily Free Wilson, Frank Zetzman, Lynn Zetzman. A showcase celebrating the rich tradition of clay artists and education at UW system campuses and regional high schools supported by Dave and Mike Jacobs of the Paoli Clay Company. Organized by Randall Becker. Hours During NCECA: Sun 1PM-4PM, Mon 10AM-4PM, Tues 10AM-4PM, Wed10AM- 4:30PM, Thur 10AM-9PM, Fri 10AM-4PM, Sat 10AM-4PM. Reception: Thur, Mar 20, 5-9 PM. Mar 8-22. Heather Cook Elliott Photography, Suite 302, 770-317-1875. CIE Plenty, Katie Coughlin, Allison Rose Craver. An investigation of tableware’s romantic role in the development of ritual and memory. The show includes individual work by each artist, as well as a collaborative installation. Organized by Allison Rose Craver. Hours During NCECA: Tues 9AM-4PM, Wed 9AM-4PM, Thur 9AM-4PM, Fri 9AM-4PM, Sat 9AM-4PM. Reception: Thur, Mar 20, 6-9 PM. Mar 18-22. Portrait Society Gallery, Suite 526, 414-870-9930. LG F(c), Krijn Christiaansen & Cathelijne Montens, Stephanie Davidson & Georg Rafailidis of Touchy-Feely and Thomas Müller. Features designers, artists, and architects whose ceramic works play with tense structures, anticipation, and the performance of objects. Within this exhibition, artists utilize the most real abstractions to present contingency—where possibilities of what things are, how they may function, and what they could be are ever greater and unknown. The participants in this exhibition have all held artist residencies at the European Ceramic Work Centre in Hertogenbosch, Netherlands—a leading center for the development of ceramics in an artist residency context for more than forty years. Curated by Ariel A. Brice. Hours During NCECA: Wed 12PM-5PM, Thur 12PM-5PM, Fri 12PM-5PM, Sat 12PM-5PM. Reception Time: Thur, Mar 20, 5-9PM. Mar 14-Apr 12. I am a ceramist with part ownership of an art gallery in the Marshall Building, THE Fine Art Gallery. The Marshall Building is an awesome, exciting place with lots of opportunities to connect with other artists. The co-owners of our gallery are graciously giving me extra space to exhibit my recent work during NCECA. I am excited to share these pieces originating in the world of folk and fairy tales. We are easy to find: Once you are in the Marshall Building, simply walk straight ahead when the elevator opens on the second floor. Safe travels, my friends!